Last night I was watching some Hulu, when a really great commercial came on. It was for a prescription drug called Intermezzo. I immediately liked this drug, because a) it works as a middle-of-the-night sleep-aid, so you only take it when you can’t fall back asleep, which has been a problem for me and many people I know, b) it’s name means something close to “interlude” in Italian, which is a surprisingly relevant and fun name for a prescription drug, and c) the commercial stars a cartoon light bulb. This particular cartoon light bulb, like most cartoon light bulbs, is SUPER happy. He (I know it’s a “he” because there are no eyelashes) is all lit up and smiley. Really happy and rested. Good morning, light bulb! Glad you didn’t choke on your tongue or sleep-drive! 1. You must have at least four hours left for sleep when taking Intermezzo. 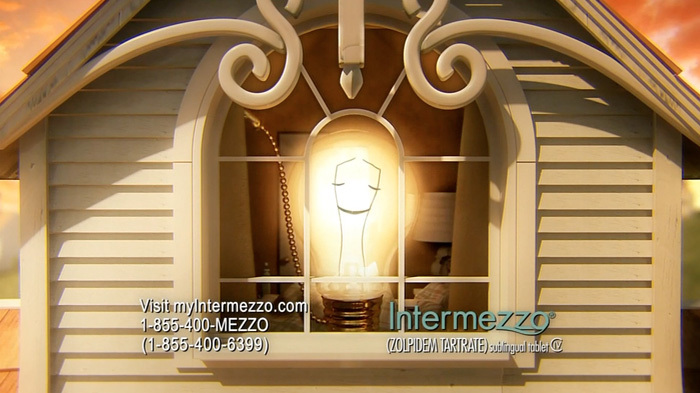 Sometimes I wake up with about three hours left on the clock, but I guess I can’t use Intermezzo in those instances. Fine. Over it. I’ll take Tylenol PM for children. 2. Allergic reactions such as shortness of breath or swelling of the throat or tongue may occur, and may be fatal. Hold up. That seems extreme for an extra few hours of sleep. And why is she so nonchalant about this? 4. Abnormal behaviors may include aggressiveness, agitation, hallucinations, or confusion. Actually, I’m cool with all of that. 5. In depressed patients, worsening of depression, including risk of suicide, may occur. I’m going to guess that a lot of people who wake up in the middle of the night and can’t fall back asleep are depressed. This feels like a bad idea. Then the sun comes back up, and the light bulb is fully rested. What? That lady just made this sound like the worst substance ever created! Maybe they shouldn’t sell this stuff. Is the light bulb ok? He doesn’t even know what’s going on. He probably doesn’t even know his own name! A few weeks ago, I finally got something I never knew I needed: a Whirley Pop. 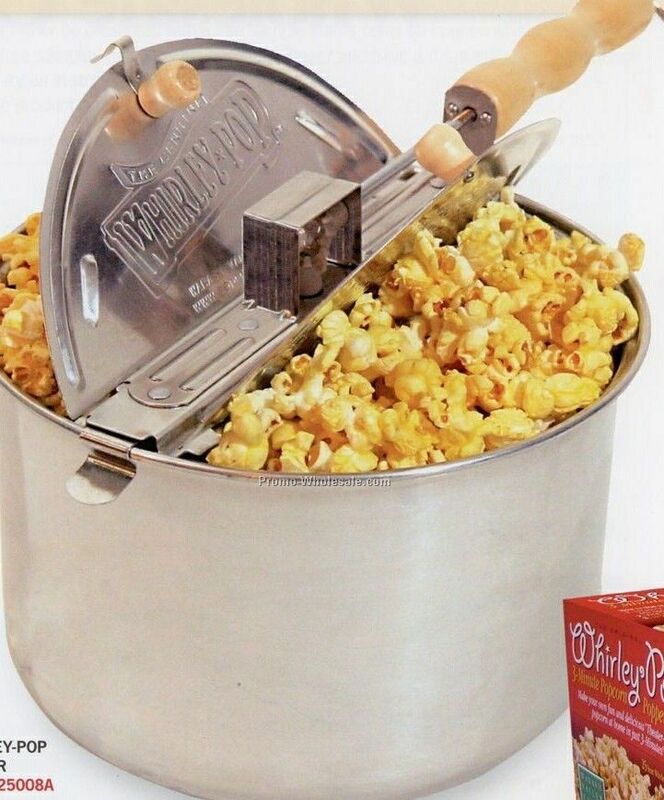 For those who don’t know, The Original Whirley Pop is an old timey stove-top popcorn popper that makes massive amounts of popcorn in three to four minutes, aka my dream come true. Luckily, the Whirley Pop was on sale for a measly $10 at Target post-holidays, so I snagged me one. I’ve only used my Whirley Pop once, as it seems like the sort of machine only to be enjoyed on special occasions (like when I’m home alone on a Friday night or when I forget to eat lunch on a Sunday). I thought the Golden Globes would be the perfect time to give her a spin, so I read the instructions more carefully than I did those for my computer, because the Whirley Pop is more important to me. After spending about five minutes prepping the machine, I was ready to use my first popping kit. I poured the oil and kernels into the metal tub and got to cranking. Before I knew it, some rapid-fire popping was going down. It’s happening, I thought. It’s really happening! Let’s cut to the chase: the popcorn was buttery bomb and plentiful. I could barely pay attention to Tina and Amy for the warm crunchy kernels that lay before me. The popping kit claimed that it made enough popcorn for five servings, but two of us split it just fine (and by two of us, I mean me and another person who had two handfuls). I was so happy, and thrilled that I’d registered my Whirley Pop. Yes, you should ALWAYS register your Whirley Pop. When you register, you receive a 25-year warranty on your Whirley Pop Popper (I swear, if this thing breaks on year 24 I’m getting me a new Whirley), two real theater all-inclusive popping kits, four individual authentic popcorn serving tubs, a tips and tricks guide for making great popcorn, and a complete popcorn party guide. And guess who received all of her free thank-you gifts from Whirley Pop today? Don’t be jealous. It was me. The very special letter from Wabash Valley Farms, the Whirley Pop parent company (duh), is very encouraging. “You made a great decision…” it starts. Yeah, I know! This popcorn maker rules! You’d have to be pretty dumb to think you were at the movies just because you were eating delicious popcorn. There are many other factors indicators that you are at the movies, such as you paid $12 for a ticket, and you’re surrounded by other people staring in the same direction, and you’re watching a movie that is on a screen that is bigger than the one on your laptop. I get what you’re saying, President of Whirley Pop, but come on. I was thrilled to see that the kit contained everything highlighted when I registered my Whirley Pop. The 10 Quick Tips to Making Great Popcorn guide will surely come in handy. The silliest tip is #7: Deck the Halls–For a popcorn garland, it’s best to use butterfly-shaped popcorn–the large fluffy kind that has protruding “wings.” What? Who said anything about popcorn garland? The catalog that was sent is also quite intriguing. Did you know that I can buy 50 lbs. of popcorn? Well, I can. Now. Also, did you know that popcorn comes in varieties including but not limited to vintage red, midnight blue, extra large caramel, baby yellow, big & yellow, and lady finger. Well, it does. There are a number of popcorn serving tubs and oils in the catalog. There are various seasonings and recipes, even customer testimonials. In additon, the How to Throw a Popcorn Party will undoubtedly come in handy. The five sections are entitled Invitations, Food, Decorations, Entertainment, and Party Favors. Each section is more informative than the last. Look out for your Evite in the coming months. There is also a toll free number that you can call if you have a popcorn emergency, and I WILL have a popcorn emergency. I’m going to call one day, enraged the way people are when they call Time Warner or Experian. I’ll say something like, “I need more popcoooooorrrrrrrn!” And they’ll send me some popcorn. David and I arrived at the bus station just in time to wait in line for an hour. We’d brought a sandwich to share for lunch, during the bus ride to Mont Tremblant. As soon as we sat on the bus, we unwrapped and devoured the thing. We wouldn’t stop for three hours, and we were both hungry by the time we hit the highway, so we just had to deal. 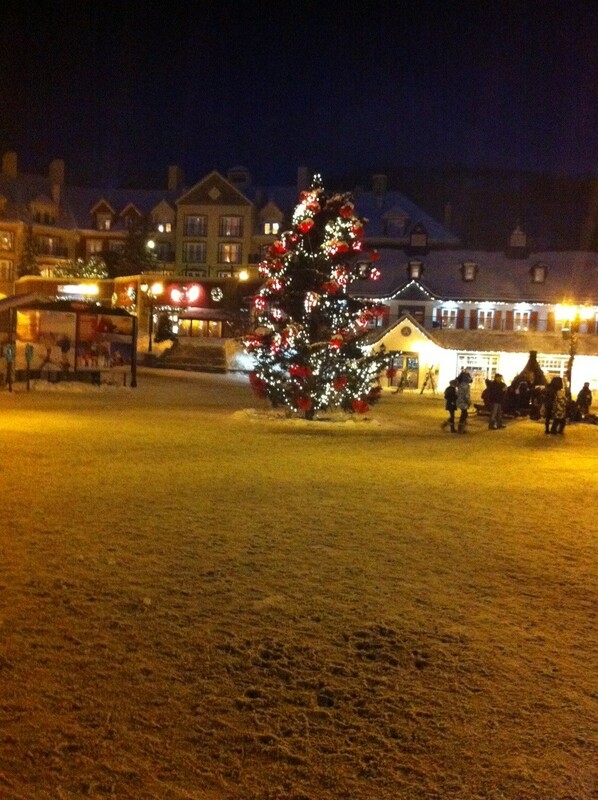 We arrived in Tremblant around 5pm, just as the sun was setting behind the snow-covered mountains. It was one of the most naturally beautiful scenes I’ve ever laid eyes on, but I was super hungry, so I cared very little. The bus dropped us off in the Village of Mont Tremblant, a quaint town at the bottom of the ski resort, that looks like a fairy-tale land. Again, cute but…feed me. We made our way to the town’s only grocery store (a tiny place filled with English-speakers buying $6 cans of soup). After about 30 minutes rummaging, we had some dinner fixin’s: spaghetti, sausage, spinach, tomato paste, and a mini marble pound cake for dessert (it was the holidays!). We checked out (the total was $300) and waited outside for the shuttle to our condo (it had a kitchen, hence the food buying). We waited for about 35 minutes, before we became very, very suspicious. I asked a driver of a bus parked on the side about the bus to Cap Tremblant, and he kindly let me know that it stopped running at 5:15. It was now about 6:30. “You can take the city bus and walk to the top of the hill,” he suggested. That sounded doable. We’re walkers! So we hopped the city bus, asking the driver about Cap Tremblant. “They have a shuttle, you know,” he said. Oh, we knew. He let us know about where he could drop us to walk up. We rode for about five minutes, when David, all of the bags on his lap, asked me to check in with the driver. I thought this a weird suggestion, as I assumed he knew where to let us off. We’d both spoken to him. But alas, the stop was “back there” according the driver. WTF, dude? He let us off on the side of the street. It was no degrees, and all signs seemed to lead to nowhere. I walked into a small B&B to ask for help. The receptionist phoned a cab for us, and the fellow was there before we knew it. Super. He proceeded to drive us up a “hill” that I’m pretty sure was a mountain. We’d never have made it on our own. We’d be eaten by dogs or something, for sure. It was about a six minute drive to the top, and would have taken no less than 30 minutes to walk, taking falling and crying into consideration. Finally, FINALLY, we made it to the reception desk. They were kind enough to switch us to a closer condo when they realized we didn’t have a car. There was some typing and key swapping, and boom, we were ready. They gave us a map of the resort and suggested we take a special shortcut to get to there. It was nearly pitch black outside (as happens in nature places) and very snowy, as you know. David read the map and found the secret path. We began to walk across, but then something happened. On about my fifth step I fell through the snow. I didn’t fall to my death, obviously (or am I writing this post from the grave…? ), but I fell through about three feet of powder, only my right leg. So I was kind of laying in a bed of snow. “Ahhhhhhhh! Waaaaaahhhhh!” I screamed, as you do. David began to laugh hysterically, until he did the same thing (carrying three of our four bags), at which point we both erupted. It was nonsense. The path was about 20 feet long, but it took us a good three minutes to get across, falling through the fresh snow every few feet. We were cackling like a couple of old hens. When we finally arrived at our condo, we were soaked from the waist down and completely out of breath. At my command, we pulled ourselves together enough to start dinner. Things were looking and smelling delicious. And then David spilled all of the pasta into the kitchen sink. You don’t know what that feels like. “Oh no,” he said quietly. I turned, thinking he’d knocked over a glass of water or something. What I saw shocked me. We stood over the sink, pulling out steaming hot, slippery strands of pasta. I was skeptical of this tactic. “Don’t worry, I’ve done this before,” said David, rinsing off what we had salvaged. This was disconcerting news. But for some reason, I was okay with it all. My stomach had gotten the best of me. Dinner was actually pretty good, and we slept like babies who’d fallen through the snow and eaten sink pasta. The next day, I skied. It wasn’t like I woke up and said, “let’s hit the slopes!” It was like I woke up, took an early morning beginner ski class, fell backwards while standing still and listening to the instructor, slid into passersby, tripped over my own skis, straddle-fell on a Chinese-Canadian girl in my class, tried not to cry, fell on strangers on the bunny hill, fell out of my skis, and then class was over. Whoa, whoa, whoa! I had put on ski boots for the first time just three hours prior. I wasn’t ready for colored shapes. But David insisted that I seemed capable, and he’d do it with me. I knew there was very little danger involved, since the green is for beginners, but I was still on the fence. Somehow he convinced me, and I found myself floating above the mountain in a lift, wondering where I’d gone wrong. I didn’t say words, just shook my head and kept looking forward. There was barely anything holding us in that thing, and I thought I’d definitely fall if I moved or spoke loudly. But he continued to prod, and when I finally turned around, I saw one of the most beautiful landscapes I’d ever seen. I turned around and nodded speedily. Nice view, nice view. Eventually, I found myself at the top of the slope. There was a slight incline, and I began to go down it, when I lost all control and fell onto my back. It took a good 10 minutes for me to get back up. When I did I saw the sign “Welcome Beginners.” It was going to be a long way down. Things were going alright for the first few minutes of my journey. Suddenly, though, we reached a slope that was steeper than I’d anticipated, probably about the equivalent of the steps at city hall). I was going fast. Too fast. My skis were in “pizza” form, but my legs were weebly-wobbly, like a cartoon character. I had barely gotten my meek scream out when I plowed into a middle aged man. He’s okay. He let me know with a wave. Or was that the finger? I was startled, to say the least. I had been going at least 100 mph, and who knew what kind of death slopes lay ahead? David assured me that this had been the steepest and slickest, and so after some encouragement, I kept going (it was also the only way to get out of the middle of the mountains, so I didn’t really have a choice). Miraculously, I made it the rest of the way without falling. I was flying so high that I went for round two and didn’t fall at all. I then enrolled in the Olympics. Yes, you can just “enroll” in them. Luckily, there was a hot tub back at our complex, in addition to a sauna, wine, tons of food at our place, and Shameless on the TV, which made for a lovely and relaxing evening. It was a lovely end to our trip. The next day, we took an early morning bus to the airport, where we saw the Miz (yes, from Real World) and waited 100 hours, because all the flights going into New York had been held up. Eventually, we made it home, where everyone spoke English, and used normal money, and some of them were black. It was so nice to get away from the city, but the trip made me really happy that I live in Brooklyn, NY, USA. And there you have it. The story of me in Canada. There was less maple syrup than any of us expected, but what can you do? First of all, sorry for the delay, guys. I think we all needed a break at the end of 2012, amirite? Secondly, I have a lot to share from my holiday trip to Canada, so this one’s gonna be a two-parter. DEAL WITH IT. This holiday season, instead of visiting my family like a thoughtful person or combating the New York weather by traveling to a warm locale, I decided to go to Canada—a freezing cold place full of people I’ve never met. My travel buddy/boyfriend, David, joined me on the trek. The trip was two-part: two days in Montreal and two days in Mont Tremblant, a ski town, also in Quebec. I, of course, was most excited about part one, as I’d heard for years how wonderfully European Montreal is. David, of course, was most excited about part two, because he is a white person who orders from L.L. Bean. In any case, we were both very excited to visit our neighbors up north. Neither of us had ever been to Canada, and the fact that we had buddies who were willing to lend us ski apparel (thanks, Lisa and Adam!) made things much easier. And so, we packed our little carry-ons and made our way to JFK—the land of dreams and wonderment. We waited for hours by the gate, as every flight in America had been delayed. There were pigeons flying all over the inside, and I thought that was probably good luck. Also, Jenna Bush Hager was there, so I was like double good luck! Eventually, we made it to Montreal, where people immediately started speaking in French. It was as though people’s language of choice changed upon landing. Everyone was all, “oui oui, bonjour, pas de deux.” Babies were smoking cigarettes. It was a lot to take in. It seemed like we were the only American people in the “Visitors” line at customs. I did not see any other navy blue passports, nor did I hear any English. This is friggin’ Canada, I thought. What happened? Finally, the customs traffic controller sent me to a booth, where a man inspected the form I’d filled out on the plane explaining that I didn’t plan to go to a farm on my trip. “What is the purpose of your trip?” he asked. Good lord, I thought. Where AM I staying? This was more stressful than putting the fitted sheet back on the bed after doing laundry. I practically shouted “drugs!” before remembering that we’d be staying at the Village Bed and Breakfast (David later told me that, because I’d made the arrangements, he’d admitted that he had no idea where he was staying…smart, David). He handed me my passport back and bid me adieu. I knew I was going to love this place. We got out Canadian money (“it feels fake!”), which has the Queen of England’s face on it, which seems crazy…until I learned 30 seconds ago that she is the Queen of the British Empire/Commonwealth of Nations, which Canada is a part of. So, she’s kind of like the Queen of Canada, which might be a big deal, but people don’t really care about Canada. We finally made our way to the Village B&B, and you guessed it, the Village in Montreal is like Christopher Street in New York times 12. There were tons of fun looking, rainbow places lining the streets. There was even a fun place on the corner near our B&B called Teen Burger, which is owned by A&W and will undoubtedly bring much fun to the community. Upon our arrival, the B&B owner, Philipe, a lovely gay French Canadian fellow, promptly showed us to our room, which was swankier than any place I’ve ever paid for on my own. We got changed and made our way to dinner, which was very nice, but not funny, so I’ll spare you. The next day, we made our way down to the breakfast nook for cereal and coffee. “And Philipe made homemade banana cake!” Nicolas, Philipe’s partner told us. Score. We chatted with Nicolas, as their Irish setter, Sloobi, walked through the kitchen. “Sloobi, stop it!” Nicolas said playfully. I could tell she was a party animal, that Sloobi. A young man had been perusing the selection when we came down, and now I found myself sitting beside him. He was very nice and had just graduated from college in Toronto. He’d be starting a job there in a few weeks. I hadn’t the heart to tell him that we had probably fallen asleep before he had even picked out his shoes. I almost cried. Never in my life have I been outside until that time. He took two nibbles of his croissant, then made his way upstairs. “I guess somebody wasn’t very hungry,” Philipe said as he walked into the kitchen. David and I, ever the tourists, headed out the door around 10, just as many a fellow in the area were probably crawling into bed. Not many people seemed to be out, and we quickly learned that this was because not only was it a bit early for places to open, but it was also 1 degree. We’d been walking up glorious streets in Old Montreal for about an hour when I told David that my toes were frozen, and we needed to find a cafe so that I could warm up. Every cute, French-looking cafe we passed was closed, and I was getting desperate. “I’m worried about frostbite,” I said (really). “Let’s just go anywhere.” And so we went into a chain coffee shop, not unlike Panera, where we had coffee and discussed our next stop: Notre Dame. When I regained feeling in my toes, we walked for about only five minutes before reaching the basilica, and it was completely worth it. We both gasped upon entering, as the dome was twice as high as it seemed from the outside and painted in beautiful colors and patterns. It was the sort of church you don’t find in the U.S. It felt really special to be inside such a place, until I looked over to find teenagers taking iPhone pics, throwing up the piece sign next to statues of biblical figures. I can’t verify that any of the did McKayla not impressed face, but I’m pretty sure it happened at some point. The rest of the day was a flurry of bus rides and cappuccino breaks. We stopped for poutine, which is basically french fries with gravy and cheese curds on top. It might sound good to you, but it did not sound good to my tummy, so I cut that party short. Eventually, we found ourselves in a really hip store with a hip-hop DJ. For some reason, the DJ got David worked up and he bought an $80 duffle bag. We then went to a bar, which was basically the Canadian equivalent to Cheers. It was like we’d known the bartender and the other customers for years. There was even an old man at the bar, we’re talking 80ish, who drank the whole time we were there but didn’t say a word until just before we left. “You from New York. I been in 1984…” He barely spoke any English, it turned out, but boy was he trying. It was very cute, but there was no time for his nonsense. We had to go for All-You-Can-Eat sushi. On the suggestion of our new bar friends, we ate dinner at a Japanese place nearby. It turns out, the two of us can eat a lot of sushi. We just kept going and going. There was a note on the menu that demanded customers to finish their food, as they’d be charged $1 for each piece of uneaten food. That’s a challenge I can fully support. So, we went to town, then we went to bed.